Most dogs occasionally make noise while sleeping. 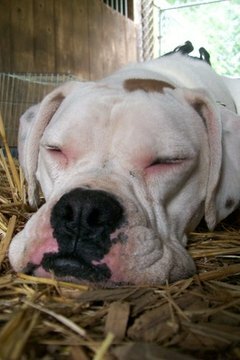 Many dog owners have chuckled as they watched their dogs crying, whining and kicking in their sleep, and wondered if their dogs dream. 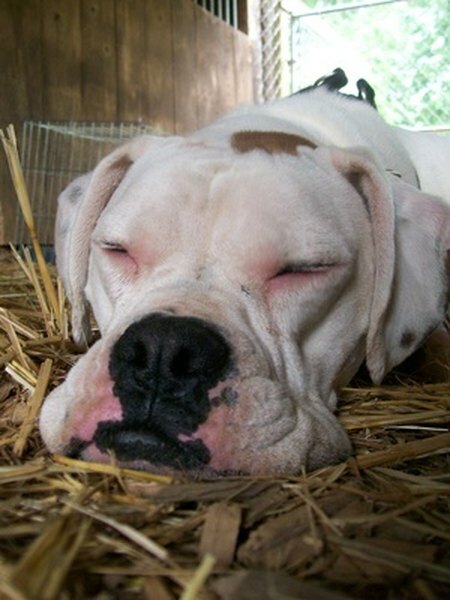 Dogs, like other mammals, do dream, and crying occurs during REM sleep. Dreaming occurs during REM sleep, a time of deep sleep during which the eyes move rapidly, producing dreams. The hippocampus, a portion of the brain dedicated to dreams, emotion and memory, functions very similarly in dogs and humans, so there's good reason to believe dog dreams function like human dreams. During dreaming, the body enters into a state of sleep paralysis that prevents dogs—and people, and all other animals that dream—from, say, actually jumping up in the air or doing other things they are doing in their dreams. However, sometimes sleep paralysis doesn't completely freeze the body, and this is why dogs' legs may twitch or why they may cry and whimper. The fact that your dog is crying doesn't necessarily mean she's in distress; her cries are more like the mumbles of human sleep-talkers—half-developed vocalizations during sleep. Dog behaviorist Stanley Coren suggests that dogs probably dream about daily dog activities, which explains why dogs so often run, whimper and bark in their sleep. Dreaming plays an important role in encoding memories and coping with daily stress, so dogs may dream about events of the previous day or things that happened long in the past. Because dogs are highly driven by smell, their dreams may have more smell-related content than human dreams. If your dog is crying as if she's in distress rather than just making small whimpering noises, she may be having a nightmare. Waking a dreaming dog up can be a risky proposition, however. If your dog is not fully awake, she may startle and snap at you. Instead, try saying her name loudly from across the room or making noises that will jar her from her sleep. USA Today: Do Dogs and Cats Really Dream? Do Blue-Eyed Siberian Huskies Get Cataracts More Than Brown-Eyed?